In this article, we have examined the Christianisation of the tribal heartlands. In our previous articles, we spoke of the areas where Hindus are under the imminent threat of becoming the minority: Western Uttar Pradesh , parts of West Bengal , Assam , Kerala and south Tamil Nadu , and Hill Jammu and Ladakh . In our article on the demographic hotspots in the Hindi heartland, we focussed on the possibility of a Mughalistan corridor, due to rising Muslim population in the Hindi heartland and the possibility of linking Bangladesh and Pakistan via this corridor and other states . In this article, we shall investigate the Christianization of the tribals in Northern, Central and Eastern India, namely in the states of Odisha, Chattisgarh and Jharkhand (Christianization has been low in the tribal belt of adjoining West Bengal and Telangana). This is the belt extending from the rapidly Christianising Nepal to the rapidly Christianising South India. For the purpose of the article, we have grouped the Indic religions together. The Sikhs, the Jains, and the Buddhists have been grouped with the Hindus, since all these are extremely small in number. Due to inconsistent reporting and poor availability of earlier statistics, we have grouped Hindus and the various Sarna religions together, though the number of the tribal religions in many places is significantly high. The Muslims (where applicable) and the Christians are reported separately. In the article, the data and statistics we have presented must be regarded as the lower bound of Christian population. This is because the infrastructure of the state is poor in the tribal regions, the areas themselves are affected often by Leftist violence, and in these regions the people declare themselves in ways that are liable to subjective interpretations. Consequently, the accuracy of the data is questionable (this is not to suggest that the Indian state has indulged in the falsification of the data; merely, that data collection is itself problematic). Many Christians, John Dayal included , have claimed that the number of Christians on the census is an underestimate. The authors’ extensive interactions with various people in the states indicate a greater number of Christians in Odisha and Jharkhand than is reported in the census. All the districts under consideration (except Ranchi, which had 10.6% Christians) had 10% or fewer Christians in 1901. Actually, all districts, except Ranchi and Sundergarh, had no appreciable Christian minorities at all. In 1901, for instance, Santhal Paraganas were 0.5% Christian, Ranchi was 10.6% Christian, Sundargarh was 9.9% Christian in 1921 (no census before that), Phulbani was 0.05% Christian in 1921, Ganjam was 0.13% Christian. There are no statistics for Raigarh till 1951 (because the district was created by the amalgamation of several Princely states). Most Christians are in erstwhile Jashpur state and they numbered a paltry few according to the Chhattisgarh native states in 1901. As may be observed from the table below, Christian population was <10% in all these districts except Ranchi and Sundargarh even in 1951. All these regions have been Christianised since, with the Christian population in many districts growing exponentially since 1991, as we observe below. Table 1: In this table, we have shown the non-Indic minority populations in the various districts where Indic populations are shrinking and Christian population is >5% or rapidly increasing. The projected non-Indic minority populations in the various districts by 2061 are shown. In places where the Muslim minority is <1%, it has been omitted. As may be observed, the Christian population is rapidly rising in most of these districts. In Ranchi, the Christian hit a low of 15.45% in 2001, but has risen to 15.53% in 2011, despite massive immigration into the district. 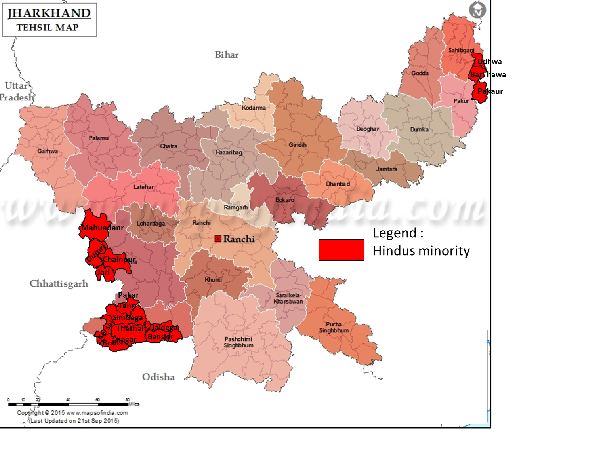 While none of these districts, with the possible exception of Santhal Paraganas, will be less than 50% Hindus in 2061 (at least, as expected now), the Christian population is set to grow rapidly in hitherto overwhelmingly Hindu areas of central India. In Table 2, we have indicated when the Christian population is projected to cross the 20% of the total population using multiple methods. Table 2: Shown in the table are the historical districts where Christians are expected to cross the 20% mark by 2061. Though in the three historical districts (Ranchi, Ganjam and Raigarh) the Christians are not expected to cross 20% by 2061, the newly carved districts from the historical ones have high Christian population. Gajapati district in old Ganjam; Simdega, Khunti, and Gumla in old Ranchi; and Jashpur in old Raigarh already have >20% Christians (Eg, Gajapati has 37% Christians and Jashpur has 22% Christians, Simdega is already Christian majority, Khunti has more than 25% Christians, Gumla has 19.75% Christians ). Consequently, in a century and a half, starting from 1901, the Christian population is rising from nearly 0 to often more than 20%, which is a significant rise, considering that these areas were almost totally Hindu. We have observed that the Christian population in the tribal heartland has been increasing in leaps and bounds since 1991. Summarizing, between 1991 and 2011, the Christian population of Jharkhand rose from 3.72% in 1991 to 4.06% in 2001 and to 4.3% in 2011. From 1951 to 1991, the Christian population of Jharkhand had fallen from 4.12% to 3.72% (mainly due to immigrations). However, the trend has been reversed since 1991 and Christian population has been rising again. In Odisha, Christian population grew from 2.1% in 1991 to 2.77% in 2011. In contrast, Christian population grew from 0.98% to 2.1% between 1951 and 1991. The nature of the rise becomes clear when we focus on specific districts within the states. In old Santhal Paraganas of Jharkhand the Christian population grew from 1.68% to 4.3% between 1991 and 2011, and in Singhbhum, the Christian population grew from 2.18% in 1991, to 2.59% in 2011, despite huge immigration into Singhbhum area. We now compare the percentage increase in Christian population, and the percentage growth of the population, between 1991 and 2011 in various districts of Jharkhand, Odisha and Chattisgarh. 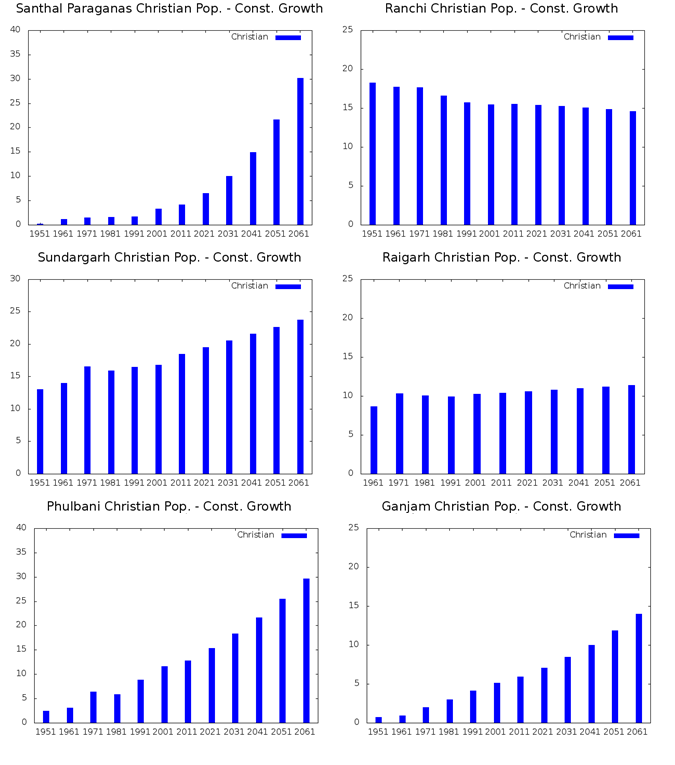 Table 3: Table comparing the growth of Christian population and total population between 1991 and 2011 in the various districts of Chhattisgarh, Jharkhand and Odisha. From the above table, it is clear that the Christian population growth (even in the census!) has substantially outpaced the population growth of the district, except in Ranchi. In the case of Ranchi, the disproportionate growth of the district is due to large scale of immigration due to industrialisation and these new immigrants are rarely tribals. Even in Ranchi, the Christian fall has turned the corner and risen from 15.45% in 2001 to 15.53% in 2011, despite huge immigration into the district. It is therefore clear that the tribals of Jharkhand, Odisha and Chattisgarh are being converted large scale in the last 20 years. However, it is pertinent to remark that Christianisation is very non-uniform, so while the 1951 districts often show Christian population percentages in 5-25% overall range in the 2011 populations, many recently created districts (from the old 1951 districts) have often higher Christian populations. In the map below, we have shown those recently carved districts (out of the old ones) where the Christian population is high (in blue) or rising sharply (purple). Illustration 1: The districts that have Christian population >5% have been marked on the map in blue. In purple are marked the districts where Christian populations are rising very sharply. In old Santhal Paraganas, the rise of Christian population in Dumka, Pakaur and Sahebganj (shown in purple) has been sharp (all three have Christian populations >5% in 2011, from a miniscule number three decades ago), while the Christian population of Godda, Deogarh and Jamtara has remained more stable. Similarly, in old Ranchi, Khunti, Gumla and Simdega show a high Christian population (>20% in all three), while the current Ranchi district has a relatively lower Christian population. In (old) Phulbani district, Baudh has almost no Christian population, while Kandhamal has a Christian population of 20% in 2011. In old Ganjam district, Ganjam has a very small Christian population, while Gajapati has very high (37%) Christian population. Finally, in old Raigarh, Raigarh has a very small Christian population, while Jashpur has a Christian population >20%. Sundargarh, which has remained unchanged in its boundaries till 2011, has had a higher Christian population since the 1950s. In the maps below, we have shown the Christian majority tehsils of Odisha and Jharkhand (no tehsil in Chattisgarh is currently Christian majority). As may be observed, they appear at the southern and northern ends of Odisha, and along the western border of Jharkhand. As an interesting point, we remark that it was on the edge of this Christian majority region of Kandhamal (in Tamudibandha tehsil) that Swami Lakshmananda was murdered. Tamudibandha tehsil, while not yet Christian majority (it is ~35% Christian now), has been rapidly rising by 6% between 2001 and 2011. Illustration 2: The map shows in red, all the tehsils of Odisha that have a Hindu minority. 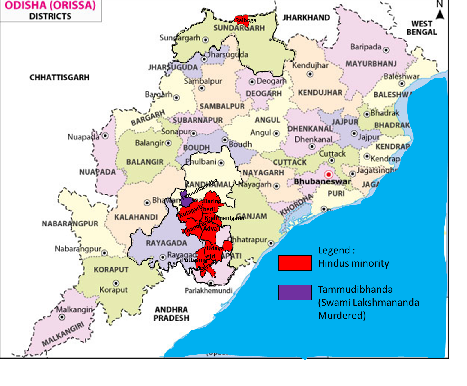 Also, in order to indicate where Swami Lakshmananda was murdered, the tehsil (which has 63% Hindus according to 2011 census) has been marked in purple. This tehsil is also losing Hindus rapidly – it lost 6% Hindus between 2001 and 2011. Illustration 3: The Hindu minority tehsils of Jharkhand. Most of them are along the Western and North eastern borders. Between Christians and Muslims, the Christians are dominant in the western border, and the Muslims in the North East. However, Christianisation of the North eastern part of Jharkhand is also progressing rapidly. In Table 4, we have shown the districts that have 5% Christians or are showing high Christian growth in the last two decades. It must be remembered that even in 1901, most of these districts barely had any Christians. The changes that have been occurring are new and rapid. Table 4: List of districts in Odisha, Chhattisgarh and Jharkhand where the Christian minority population is 5% or greater. All the statistics for Odisha, Chhattisgarh and Jharkhand have been taken from the 2011 census. It is interesting to observe that these districts are connected geographically, forming almost a corridor. Illustrations 2 & 3 clearly reveal that this corridor begins at the southern end of the tribal heartlands of southern Odisha in Rayagada, and then passes into Gajapati and Kandhamal, where Christianisation is high in recent years. It makes its way further north via old Sambalpur (where Christianisation is just a shade below 5%) and then passes into Christianised Sundargarh. Here it swings in a wide fan northward, from Jashpur in Chhattisgarh and Simdega, Gumla, and Latehar in Jharkhand, before turning eastwards into Khunti, Ranchi and Paschim Singhbhum. There is a small gap after this due to the industrial region of Dhanbad and Jamshedpur, but then Christianisation is again rising rapidly in the NE Jharkhand, in the eastern part of old Santhal Paraganas – Dumka, Sahebganj and Pakaur, where the Santhals are being organised under the Christian church. This Christian stronghold lies in the tribal heartland of India. The tribal heartlands of India extend in a south-west to north-east direction, with the south-western end of the corridor in Northern Telangana (Adilabad and Bhadrachalam districts), and the north-eastern end of the corridor in western West Bengal (Purulia and Birbhum districts) and north-eastern Jharkhand (Santhal Paraganas). The tribal corridor covers all of western and central Odisha (everything north west of a line connecting Mayurbhanj and Gajapati districts), all of Jharkhand (excluding a few industrial cities like Jamshedpur, Bokharo and Dhanbad, that have been planted in its midst), all of Chhattisgarh, south eastern Madhya Pradesh (Shahdol and Mandla districts) and the north eastern corner of Andhra Pradesh (Srikakulam). This tribal heartland is vital to India due to the fact that the region has never been conquered by the Islamists. Even when the Islamists managed to win wars against this tribal region, the region remained untouched by Islamists and was a solid block of Indic population. The declining Indic population in a contiguous corridor within this hitherto solidly Indic region is a cause for concern, particularly given the rate at which the Indic population is being Christianised. It is safe to say that as late as 1700, the Indic population in every single district in the region was easily over 95% and as late as 1850, the Christian population of the region was miniscule (<1%). This latter factor is rapidly changing. 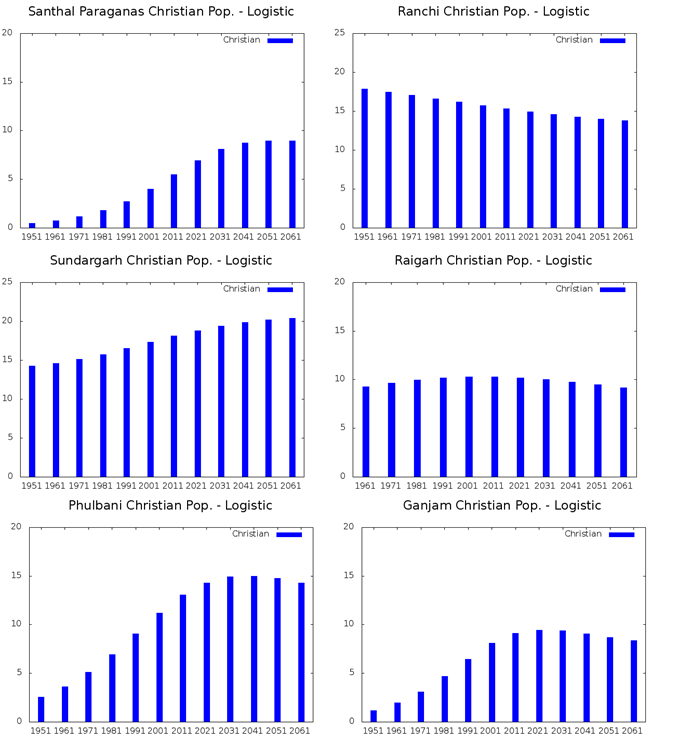 For all the districts that have been named, we have computed the growth rates across different communities of significance using the constant growth, the polynomial and the logistic models. We have analysed the results of all the three techniques separately. In the constant growth model, we have assumed that the average growth over the last 2 decades for the different communities will hold in future and have predicted the populations based on those numbers. The populations of the various communities in the various districts have been shown above. One sees the Christian population of Phulbani, Santhal Paraganas, and Sundargarh cross 20% by 2061 in this model. The Christian population of Ganjam rises from 0.7% in 1951 to 13.9% by 2061. The Christian population of Ranchi has held its share, despite massive Hindu immigration from the other states to this district and is indeed, now beginning to rise again. In Raigarh, the Christian population has held its share despite heavy immigration from the other areas. In the polynomial model, we have fitted a cubic polynomial, minimising the square error for the different communities. The cubic model can more accurately model the rapid rises and falls in the changes. 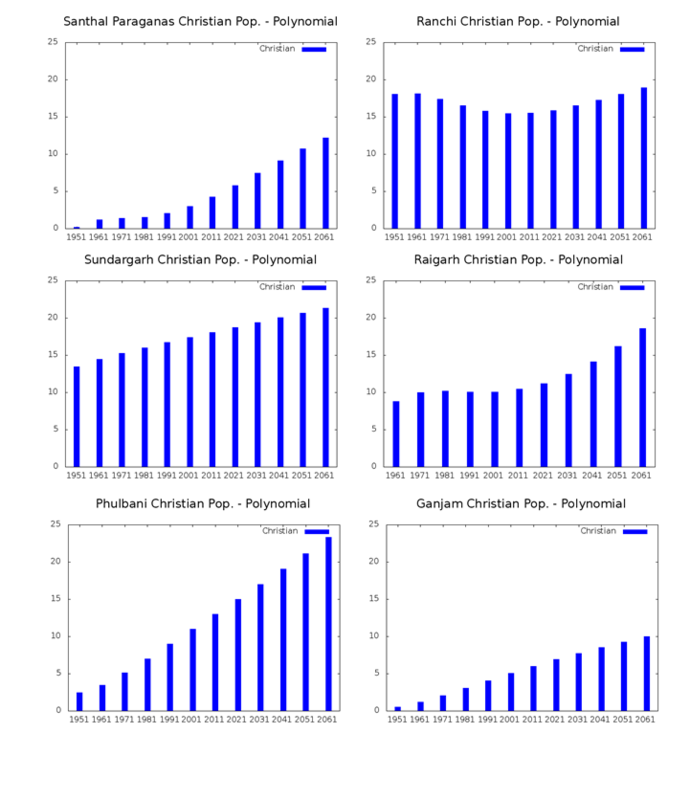 In the polynomial model, the Christian population of Raigarh, Ranchi, Phulbani, and Sundargarh is seen getting close to or beyond 20%. In Ganjam, it touches 10%, while in Santhal Paraganas, it is seen hitting 13% of the total population. We believe this technique to be the most accurate representation of the different models. In this logistic model, we try to fit a logistic curve to the data points, minimising the square error in the process. We do not believe that this technique is a good fit for the region that is showing rapid changes in populations like Ranchi, Ganjam or Santhal Parganas. However, for the sake of completeness, we have included this technique in our examination too. The logistic model may be considered a lower bound on the changes possible. However, the most conservative case shows the Christians hitting 10% or more in almost all these districts, where just a hundred and fifty years ago, there were barely any Christians. In this article, we have examined the Christianisation of the tribal heartlands. We have shown the sharp fall of the Indic population of the tribal heartlands since independence, and in particular, in the last two decades. It is clear that though the Christianisation of the tribal region has been proceeding apace from the 1850s, it has accelerated greatly since 1991. In the second and concluding part of this article, we examine the causes, and history of this rapid Christianisation and attempt to provide some solutions to this phenomenon. AP Joshi, MD Srinivas and JK Bajaj, “Religious Demographics of India’’, CPS Publications. Srinivas and JK Bajaj.